An event Tuesday night at a downtown Kitchener resident will see at least 20 women running for mayoral, council or school trustee seats meet and discuss the municipal election. Women from across Waterloo region who are running for council and school trustee seats will gather in downtown Kitchener Tuesday night. The meeting has been organized by Stephanie Stretch. She's running for a council seat in Kitchener's Ward One. There are at least 20 other female mayoral, council and school trustee candidates who have said they'd attend the event, including Susan Stark who is running against Stretch. "It's been so encouraging," Stretch said of the response to the event. "There's already a community or a sense of camaraderie." Stretch says she feels some people have a preconceived thoughts about her when she goes door-knocking for the campaign. "I'm proud to have them pause for a second when I say, 'Hi, I'm running for councillor in your neighbourhood.' That second when people readjust; I'm happy to be someone changing people's stereotypes of what someone should look like if they're doing that," she said. "Whether it's my age, whether it's my gender, it's sometimes hard to tell. I think people are surprised when they see a younger woman knocking on the door saying I'm qualified and I can do this." Fauzia Mazhar is planning to go to the meeting. She's running in Kitchener for regional council. 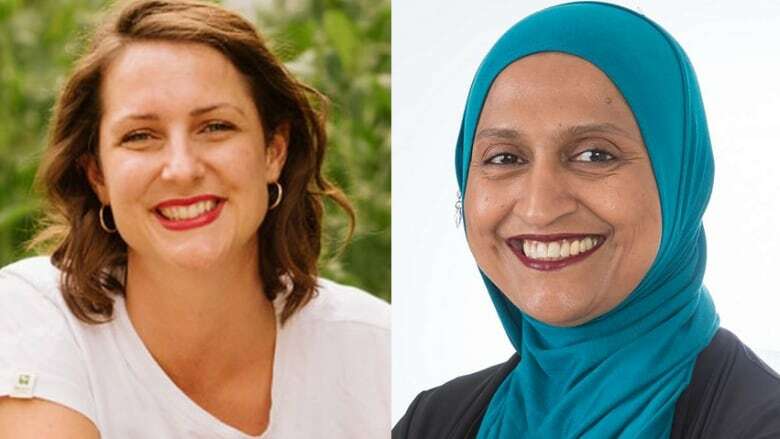 "I'm running because of my strong belief that the council must represent the diversity of the community that it serves and female participation and female representation on council is currently 37.5 per cent," she said. She said she's received a lot of support but has also faced racism when she talks to voters in person or on social media. "They don't talk about my ability or my capacity to do things or my experience. They more talk about the way I came to this country or whatever it is that doesn't just make me a good candidate for them to vote [for]," she said. "There has been some negative response, but I would say it has been muted." Tuesday's meeting will also be a chance for Mazhar to connect with women she's been talking to online since the start of the election. They've set up Facebook groups and chats to support on another, offer advice and share resources. "That's been a trend in this municipal election," Mazhar said of that support between female candidates. For the event Tuesday night, everyone is welcome, Stretch says. "We invited female candidates, male candidates are welcome as well. We want to spend our time highlighting the female candidates," Stretch said. "In the past, it's been all men, so we'd like to see a much more diverse group of people running in politics, being elected in politics." It's a chance for the candidates to talk to each other about their campaigns, for the public to ask questions of their candidates, and Stretch says it's also a good opportunity for women who are considering a career in politics to hear from women who are in the midst of an election. The event starts at 7 p.m. at Gilt Restaurant in downtown Kitchener.